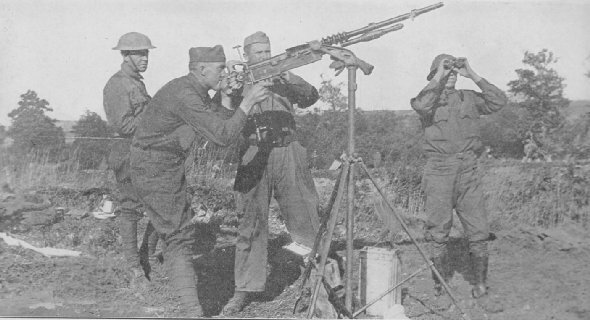 Anti-aircraft machine gun team, 1st Balloon Co. L to R: Feeder T. L. Dinsmore; Gunner George Hicks; Feeder J. S. Shear, and observer L. J. Funk, St. Veul, France. German planes trying to get information were driven back. 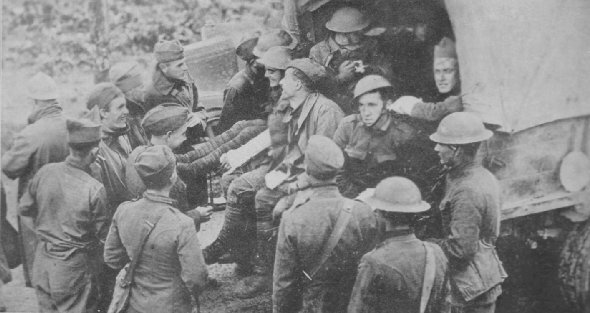 First to return from St. Mihiel front; wounded, 9th Inf., 2nd Div., Domevre-en-Haye, France, Sept. 12, 1918. Excitement prevents their realizing the extent of their injuries. The cross on the forehead indicates a gas patient.